'VisualJockey' a name that has been a mainstay of the VJ culture from its birth in 1999 to the release of Gold in 2006. Used as a live VJ tool, content creator, or instalation facilitator, wherever you find visuals you will find VisualJockey lurking somewhere. 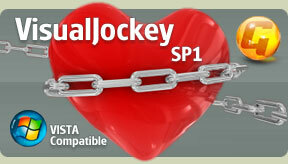 With the birth of VisualJockey SP1, that toolset just got extended, but more importantly free! Yes, you read that right, VisualJockey is now FREE! Free to download. Free to use. And Free for you to use as you want. SP1 has a new UI with full thumbnails throughout. New tools such as flowerpower2 and gestalt providing global keystone. Live previews and Vista compatibility. SP1 is more than a service pack, in development and testing for nearly two years, SP1 is the most stable release of VJO (VisualJockey) ever and comes complete with everything, all plugins, drivers and over 1000 samples to get you started!